The Isles Dernieres barrier island chain is experiencing some of the highest erosion rates of any coastal region in the world. Raccoon Island is experiencing shoreline retreat both gulfward and bayward, threatening one of the most productive wading bird nesting areas and shorebird habitats along the gulf coast. An existing demonstration project on the eastern end of the island, Raccoon Island Breakwaters Demonstration project (TE-29), has proven that segmented breakwaters can significantly reduce, and perhaps even reverse, shoreline erosion rates. The primary goal of this project is to protect the Raccoon Island rookery and seabird colonies from the encroaching shoreline by: 1) reducing the rate of shoreline erosion along the western, gulfward side and 2) extending the longevity of northern backbay areas by creating 60 acres of intertidal wetlands that will serve as bird habitat. This project has been separated into two construction phases, Phase A and Phase B. Phase A includes the construction of eight additional segmented breakwaters gulfward of the island and immediately west of the existing breakwaters demonstration project and an eastern groin that will connect existing Breakwater No. 0 to the island. Phase B involves the construction of a retention dike along the northern shore to create a back bay enclosure that will be filled with sediments dredged from the bay and/or gulf, followed by vegetative plantings. 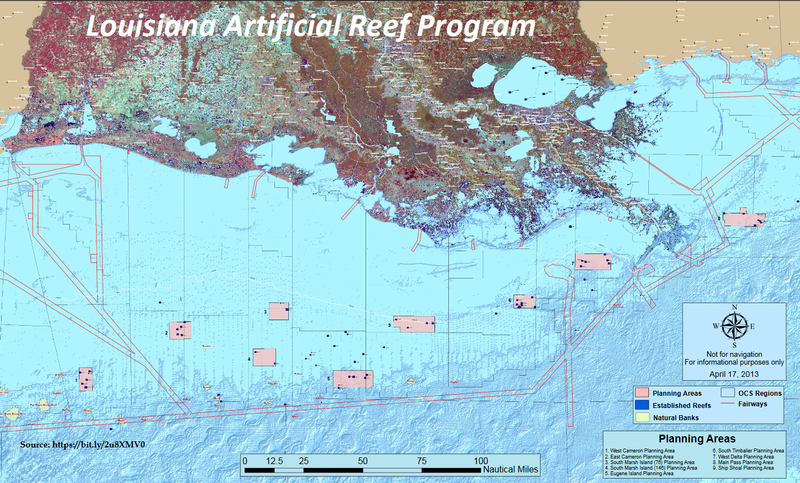 The project is located in the Terrebonne Basin on the western-most island of the Isles Dernieres barrier island chain in Terrebonne Parish, Louisiana. This project was selected for engineering and design funding at the January 2002 Breaux Act Task Force meeting. Construction funding for Phase A was approved in October 2004. Request for Phase B construction funding is anticipated to occur in January 2008. Marsh is a type of wetland that is continually flooded with water. 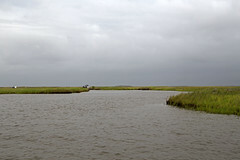 Marshes can be found both on the coast or inland. Most of the water present is due to surface water; however, some groundwater also fills this wetland area. Marshes can be divided into two main categories: non-tidal and tidal. Female blue crabs mate only once during their lifetime. The average lifespan of a blue crab is 3 years. Blue crabs are crustaceans with a hard upper shell, typically grey, blue, or brownish-green in color. The blue crab gets its name from its sapphire-tinted claws. Blue crabs have two large claws, six walking legs, and two paddle-like swimming legs. One thing that sets male and female crabs apart is that females have red tips on their claws. Another distinction between male and female blue crabs is the shape of the abdomen. A blue crab male’s abdomen has a long, narrow, inverted “T” shape while females have a broader, rounded “U” shaped abdomen. Blue crabs spend the majority of their lifetime in estuaries which often have accessible shorelines, making blue crabs a delicious challenge to catch. Blue crabs are not only sought after by commercial fishermen but recreational crabbing has become rather popular as well. Louisiana’s blue crab fishery is the largest in the United States accounting for more than half of the total amount harvested in the Gulf of Mexico each year. Blue crabs are prized for their sweet, tender meat and are one of the most popular forms of seafood in the United States. Blue crabs tend to feed on oysters, mussels, snails, plant and animal detritus, and even smaller or soft-shelled blue crabs. These creatures are very sensitive to environmental changes and populations will drastically decline if habitats are disturbed. The blue crab relies heavily on healthy wetlands for survival and the sustainability of their population. The Coastal Wetlands Planning, Protection, and Restoration Act supports healthy estuaries that serve as habitat for species such as the blue crab.